Nefaarud I or Nayfaurud I, better known with his hellenised name Nepherites I, was an ancient Egyptian pharaoh, the founder of the 29th Dynasty in 399 BC. It is believed that Nepherites was a general from the deltaic city of Mendes who, in the autumn of 399 BC, rose against pharaoh Amyrtaeus, defeated him in open battle, and then executed him at Memphis. Nepherites then crowned himself pharaoh at Memphis and possibly also at Sais, before shifting the capital from Sais to his hometown Mendes. The fact that Nepherites I chose the same Horus name of Psamtik I and the Golden Horus name of Amasis II – both relevant rulers of the earlier 26th Dynasty - is thought to demonstrate that he wanted to associate his rule with an earlier 'golden age' of Egyptian history. According to Manetho, Nepherites I ruled for six years, although his highest archaeologically attested date is his regnal year 4. Evidence of Nepherites' building work has been found in a number of locations across the country. In Lower Egypt, he is attested at Thmuis, Tell Roba, Buto (where a statue of him has been found), Memphis, Saqqara (where an Apis burial took place in his regnal year 2) and his capital and hometown Mendes. In Middle and Upper Egypt, he ordered a chapel at Akoris while at Akhmim, near Sohag, there is evidence of the worship of a statue of him which was placed inside a naos. He also added some buildings at Karnak such as a storeroom and a shrine meant to house a sacred bark. 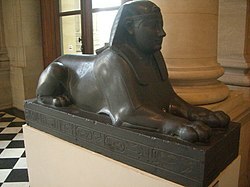 A basalt sphinx with his name is now located in the Louvre, but it was known to have been brought to Europe as early as the 16th century, having adorned a fountain at the Villa Borghese, Rome. In foreign affairs, he resumed the policy of Egyptian intervention in the Middle East. As reported by Diodorus Siculus, in 396 BC he supported the Spartan king Agesilaus in his war against the Persians; the Spartans had conquered Cyprus and Rhodes and were attempting to extend their influence further east. Nepherites supplied the Spartans with 500,000 measures of grain and material for 100 triremes. However, the cargo reached Rhodes just after the Persians managed to retake the island, so it was entirely seized by the philo-Persian admiral Conon of Athens. Nepherites I died during the winter of 394/393 BC after six years of reign. The Demotic Chronicle simply states that "his son" was allowed to succeed him, without providing any name. Nowadays it is generally believed that Nepherites' son was Hakor, who ruled after him for only a year before being overthrown by an apparently unrelated claimant, Psammuthes; Hakor, however, was able to retake the throne the following year. A tomb believed to be that of Nepherites was discovered by a joint team from the University of Toronto and the University of Washington in 1992-93. Possible ownership of the tomb was identified by the presence of a shabti bearing the name of Nepherites I; however, definitive proof has not been found. Although still containing funerary objects and a large limestone sarcophagus, the tomb was believed to have been destroyed by the Persians in 343 BC. Ceramic vessels containing fish specimens and fish-covered stelae have been found on the site of Nepherites's funerary complex. The presence of the fish, often interpreted as votive offerings, could be an indication that the site was previously occupied by a temple of the fish-goddess Hatmehyt. Muthis – A conjectural pharaoh, once believed to be Nepherites I's son. ^ a b Redford, Donald B. (2004). Excavations at Mendes: The Royal Necropolis. 1. Leiden, Germany: Brill. p. 33. ISBN 978-90-04-13674-8. ^ Dodson, Aidan (2000) . Monarchs of the Nile (2 ed.). Cairo, Egypt: The American University in Cairo Press. p. 196. ISBN 978-0-9652457-8-4. ^ a b c d Grimal, Nicolas (1992). A History of Ancient Egypt. Oxford: Blackwell Books. pp. 372–3. ISBN 978-0-631-17472-1. ^ a b Shaw, Ian (2000). The Oxford History of Ancient Egypt. Oxford, UK: Oxford University Press. p. 378. ISBN 978-0-19-280458-7. ^ Royal Sphinx with the name of the Pharaoh Achoris. The Louvre. n.d. Retrieved 4 July 2014. ^ Sweeney, Emmet John (2008). The Ramessides, Medes, and Persians. Ages in Alignment. 4. USA: Algora. p. 147. ISBN 978-0-87586-544-7. ^ Gardiner, Alan (1961). Egypt of the Pharaohs: an introduction. Oxford: University Press. p. 374. ^ Ray, John D. (1986). "Psammuthis and Hakoris", The Journal of Egyptian Archaeology, 72: 149-158. ^ a b Arnold, Dieter (1999). Temples of the last Pharaohs. Oxford, UK: Oxford University Press. p. 102. ISBN 978-0-19-512633-4. ^ Dodson, Aidan (2009) . "6". The Canopic Equipment of the Kings of Egypt. Studies in Egyptology. Oxford, UK: Routledge. ISBN 978-0-7103-0460-5. ^ Riggs, Christina, ed. (2012). The Oxford Handbook of Roman Egypt. Oxford, UK: Oxford University Press. p. 34. ISBN 978-0-19-957145-1. Retrieved 4 July 2014. Wikimedia Commons has media related to Nepherites I.
Mendes, the Greek name of the Ancient Egyptian city of Djedet, also known in Ancient Egypt as Per-Banebdjedet and Anpet, is known today as Tell El-Ruba. Djoser was an ancient Egyptian pharaoh of the 3rd dynasty during the Old Kingdom and the founder of this epoch. He is also known by his Hellenized names Tosorthros and Sesorthos. He was the son of king Khasekhemwy and queen Nimaathap, but whether he also was the direct throne successor is still unclear. Most Ramesside Kinglists name a king Nebka before him, but since there are still difficulties in connecting that name with contemporary Horus names, some Egyptologists question the received throne sequence. Menes was a pharaoh of the Early Dynastic Period of ancient Egypt credited by classical tradition with having united Upper and Lower Egypt and as the founder of the First Dynasty. 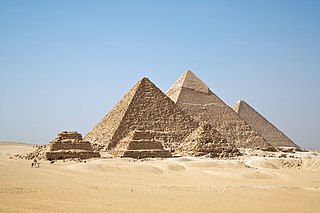 The history of ancient Egypt spans the period from the early prehistoric settlements of the northern Nile valley to the Roman conquest, in 30 BC. The Pharaonic Period is dated from the 32nd century BC, when Upper and Lower Egypt were unified, until the country fell under Macedonian rule, in 332 BC. Amenhotep I from Ancient Egyptian "jmn-ḥtp" or "yamānuḥātap" meaning "Amun is satisfied" or Amenophis I, (,), from Ancient Greek Ἀμένωφις, additionally King Zeserkere, was the second Pharaoh of the 18th dynasty of Egypt. His reign is generally dated from 1526 to 1506 BC. He was a son of Ahmose I and Ahmose-Nefertari, but had at least two elder brothers, Ahmose-ankh and Ahmose Sapair, and was not expected to inherit the throne. However, sometime in the eight years between Ahmose I's 17th regnal year and his death, his heir apparent died and Amenhotep became crown prince. He then acceded to the throne and ruled for about 21 years. Although his reign is poorly documented, it is possible to piece together a basic history from available evidence. He inherited the kingdom formed by his father's military conquests and maintained dominance over Nubia and the Nile Delta but probably did not attempt to maintain Egyptian power in the Levant. He continued the rebuilding of temples in Upper Egypt and revolutionized mortuary complex design by separating his tomb from his mortuary temple, setting a trend in royal funerary monuments which would persist throughout the New Kingdom. After his death, he was deified as a patron god of Deir el-Medina. Nectanebo II, ruled in 360—342 BC was the third and last pharaoh of the Thirtieth Dynasty of Egypt as well as the last native ruler of ancient Egypt. The pharaohs were rulers of Ancient Egypt dating from the unification of Upper and Lower Egypt during the Early Dynastic Period by Narmer approximately 3100 BC. Although the specific term "Pharaoh" was not used by their contemporaries until the rule of Merneptah of the 19th dynasty, c. 1200 BC, the style of titulature of the rulers of Egypt remained relatively constant, initially featuring a Horus name, a Sedge and Bee (nswt-bjtj) name and a Two Ladies (nbtj) name, with the additional Golden Horus, nomen and prenomen titles being added successively during later dynasties. Djer is considered the third pharaoh of the First Dynasty of ancient Egypt in current Egyptology. He lived around the mid-thirty-first century BC and reigned for c. 40 years. A mummified forearm of Djer or his wife was discovered by Flinders Petrie, but was discarded by Emile Brugsch. Hor-Aha is considered the second pharaoh of the First Dynasty of Egypt by some Egyptologists, others consider him the first one and corresponding to Menes. He lived around the 31st century BC and is thought to have had a long reign. Wahankh Intef II was the third ruler of the Eleventh Dynasty of Egypt during the First Intermediate Period. He reigned for almost fifty years from 2112 BC to 2063 BC. His capital was located at Thebes. In his time, Egypt was split between several local dynasties. He was buried in a saff tomb at El-Tarif. Amyrtaeus of Sais is the only Pharaoh of the Twenty-eighth Dynasty of Egypt and is thought to be related to the royal family of the Twenty-sixth Dynasty. He ended the first Persian occupation of Egypt and reigned from 404 BC to 399 BC. Amyrtaeus' successful insurrection inaugurated Egypt's last significant phase of independence under native sovereigns, which lasted for about 60 years until the Battle of Pelusium in 343 BC. Kheperkare Nakhtnebef, better known by his hellenized name Nectanebo I, was an ancient Egyptian pharaoh, founder of the last native dynasty of Egypt, the thirtieth. The Third Dynasty of ancient Egypt is the first dynasty of the Old Kingdom. Other dynasties of the Old Kingdom include the Fourth, Fifth and Sixth. The capital during the period of the Old Kingdom was at Memphis. The Twenty-ninth Dynasty of Egypt is usually classified as the fourth Dynasty of the Ancient Egyptian Late Period. It was founded after the overthrow of Amyrtaeus, the only Pharaoh of the 28th Dynasty, by Nefaarud I in 398 BC, and disestablished upon the overthrow of Nefaarud II in 380 BC.